Reflective of the luxury high-rise Plaza Towers’ own architecture, this kitchen redesign in Buckhead, Georgia by Mark Williams Design Associates blends mid-century modern with 21st century amenities. What began as a galley-style kitchen is now an open, inviting space that’s 100 percent functional as a kitchen, yet welcomes guests as a comfortable entertaining area. Designer Niki Papadopoulos filled us in on the details—including its Monogram appliances—that made this Atlanta Homes and Lifestyles magazine 2019 Kitchen of the Year winner such a success for all involved. The original parquet floors throughout most of the rooms is similar in color to the kitchen cabinetry; a choice consciously made during the early room-design phase. The Monogram built-in, custom panel refrigerator is clad in the same wood as the cabinets, allowing it to fade into the cabinet-lined walls of the contemporary room. This, along with its concealed appliances, allows the room to feel like an extension of the whole condo and not just a kitchen. The muted, honey tone of the wood cabinets sets a warm backdrop for the antique brass Eclat chandelier by Jean de Merry—which inspired the rest of the room. Its brass spikes provide an explosion of warm light; it’s an eye-catching element indicative of mid-century design. Many other finishes in the kitchen are also brass in relation to this focal point. In keeping with the sleek lines and geometric designs of mid-century style, the modern white subway tile backsplash was stacked, creating graphical pattern that lies stark against the organic wood grain of the cabinets. The flooring also contrasts with the wood with its black porcelain tiles that contain gray and white veins to mimic marble, while offering years of durability and ease of care. Though the homeowner didn’t cook much, Papadopoulos said it was important to keep the appliances multi-functional, which included the addition of a Monogram Advantium oven, which the owner loves. “Advantium really appealed to him. [It] was a perfect fit … he uses it all the time,” said Papadopoulos. “We love the tailored nature of Monogram Appliances and how they are able to adapt seamlessly into any of our designs, contemporary or traditional. They are functional, easy to use, good looking, and have outstanding performance,” she added. We are just as thrilled as Papadopoulos and Mark Williams over this kitchen renovation being named “Kitchen of the Year.” Having a part in this gorgeously designed, award-winning kitchen sets the tone for an exciting 2019. 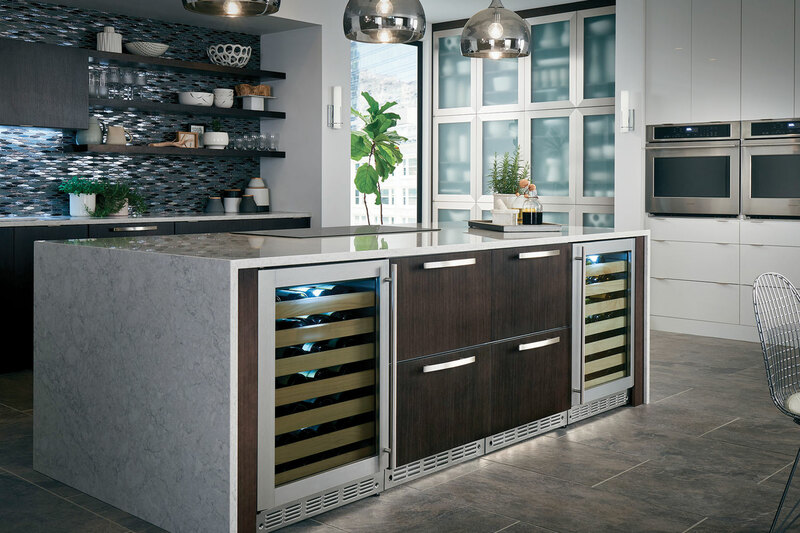 Today’s luxury kitchens are leaning toward minimalism and sleek design, and Monogram reflected this look in our two new collections debuted at the 2019 Kitchen and Bath Industry Show (KBIS). Impeccably designed by highly respected kitchen and bath designer Richard Anuszkiewicz, the Monogram space truly impressed designers, builders, homeowners, architects and everyone in attendance. The revamped Monogram Professional Collection provides a blend of modern design with traditional features. This includes new robust, edge-to-edge handles that feel more integrated with the appliances and a gleaming stainless steel finish. These appliances feature rich, interactive LCD displays with minimal use of knobs and larger glass windows for a refined, elevated look in any kitchen. Our former European line evolved to the new Monogram Minimal Collection, which takes that streamlined design to a new level. Designers eliminated knobs and handles wherever possible and replaced them with a new touch-to-open feature along with precisely machined metal framing and wide glass windows. New LCD interactive screens replace knobs, which allows the entire appliance to blend in with cabinetry. The look is sleeker, with uninterrupted lines and a very polished profile. Both collections also benefit from inspired techniques from the high-end auto industry including precision-machined aluminum extrusions, which makes seams virtually invisible. This also allows for ultra-flush installations and tighter fits between appliances and cabinets. Chef’s Kitchen featured the French-door wall oven and the Monogram Hearth Oven. Bespoke Area gave a look at the future of appliance design with customized finishes. Butler’s Pantry focused on multiuse of space with under-the-counter appliances. Professional Kitchen showed our new Monogram Professional Collection appliances. Minimal Kitchen debuted our new minimalist design for appliances. If you attended the Parade of Homes in Lakeville, Minnesota, this past September, you were able to take in the gorgeous farmhouse design of this home in person. Created by SD Custom Homes and decorated by Bria Hammel Interiors, this classically styled home seamlessly blends comfortable charm with upscale details, especially in the interior. The home’s interior designer, Bria Hammel Interiors, is based in St. Paul, Minnesota, and serves clients nationwide with residential design. They had worked with SD Custom Homes on previous projects and felt like they had a solid partnership with the home designers. One of the most important rooms of the home was the kitchen, and the two firms worked closely together to create a layout that fit with the farmhouse plan and flowed well for a modern family home. It serves as not only a place to create meals, but also as a hub of the home where people can gather at all times of the day. Both teams felt that having the sink under the window looking out over the front of the house created a beautiful focal point in the kitchen and allowed the island to be used as additional dining space. The windows bring in an abundance of natural light, which keeps the space bright and airy, and is a favorite aspect of this kitchen design. A secondary focal point is the area around the Monogram gas range top. The stainless and black range top sits against the gleaming, white tile backsplash and is flanked on each side by glass-door cabinets with curvy brackets beneath each. It’s a welcoming area where hearty meals can be cooked while family sits around the island for conversation and further meal prep. All the kitchen appliances are from Monogram, which Bria Hammel Interiors was very excited about. After touring the Monogram showroom in Chicago, they were taken aback by the innovative features offered by Monogram (especially the Advantium Speedcook oven) and the craftsmanship of the appliances. As they said on their blog, they take comfort in knowing “that whoever purchases this home will truly be getting the best of the best” with the appliances. We couldn’t agree more. Congratulations on designing an absolutely inviting kitchen and a lovely, gracious farmhouse home.